TIP: Remove the bones from the white fish and cut it into the same size as the cut paprika and cucumber. TIP: Parboil the fish flesh and vegetables after coating them with starch. TIP: Cool down the ingredients in ice water immediately after parboiling them. TIP: Place the oily pine nuts on a tissue when crushing them. TIP: Put the prepared vinegar, sugar and red chili paste at a ratio of 1:1:1. 1. Cut the white fish and vegetables into bite-size pieces and coat them well with starch. 2. Parboil the prepared ingredients and cool them down in ice water. Rich in taurine, fish not just helps prevent adult diseases and anemia, but also detoxifies the liver. 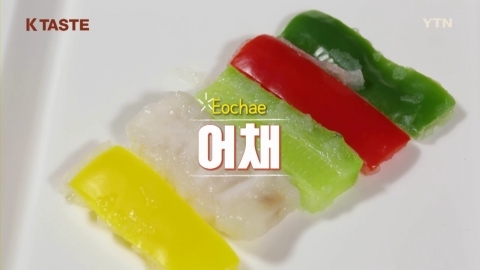 Try out this dish of Eochae (Parboiled White Fish Fillets) that melts in your mouth!